Alexander Macomb was born in Detroit, on 3 April 1782. He moved to New York and was educated in Newark, New Jersey. When he was 16, he enlisted in the New York militia. He was commissioned a cornet in the Regular Army in 1799. Macomb left the Army for two years, and then became a second lieutenant in 1801. Macomb became one of the first soldiers at the United States Military Academy when he was commissioned a first lieutenant in the Corps of Engineers, which had been created in 1802. He married Catharine Macomb, a cousin, in 1803. 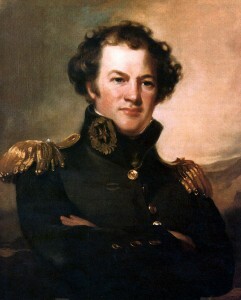 By 1810, he was a lieutenant colonel and served as chief engineer in charge of coastal fortifications in Georgia and the Carolinas. In 1812, he briefly served as acting adjutant general before he was promoted to colonel. In the War of 1812, Macomb commanded troops at Sackett’s Harbor, the capture of Fort George and the St. Lawrence campaign. In 1814, he became a brigadier general before defeating the British at Plattsburg, New York. The action in Plattsburg earned Macomb a brevet major general rank and a gold medal from Congress. In 1821, now a colonel again, Macomb became the chief of engineers. He married his second wife, Harriet Balch Wilson in 1826. Two years later he became a major general, and was the senior officer and commanding general of the Army from 29 May 1828 to 25 June 1841. As the commanding general, Macomb argued that the commanding general of the Army should have active command of the whole Army, including staff bureaus, under the loose oversight of the Secretary of War. He recommended that the Army strength be doubled to quell the Indians and instituted a program of officer retirement and replacement. He died in Washington, D.C., on 25 June 1841.